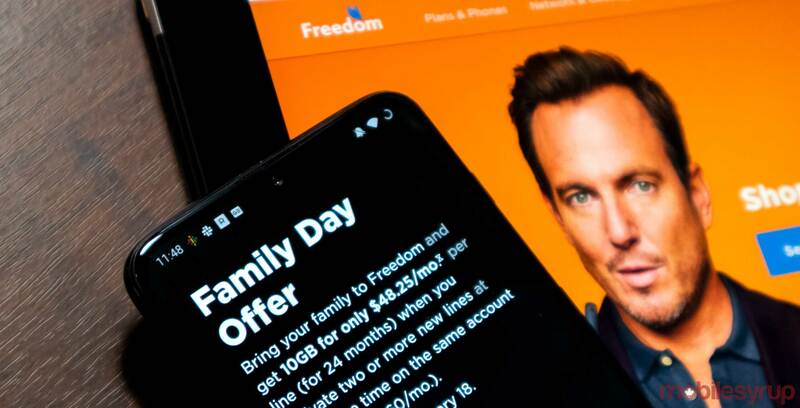 Freedom Mobile has launched a new Family Day promotion that offers customers a 15 percent discount on additional lines. Until February 18th, existing and new Freedom Mobile subscribers can get a $65/10GB Big Gig plan for as little as $48.25 per pay period when they activate two or more new lines at the same time. “Bring your family to Freedom and get 10GB for only $48.25/mo. per line (for 24 months) when you activate two or more new lines at the same time on the same account (regularly $60/mo.). Offer ends February 18,” writes Freedom on its website. Diving into the fine print, obtaining a $48.25 per month 10GB plan involves combing the current 15 percent discount that’s a part of the Family Day promotion, Freedom’s $5 Digital Discount for setting up auto pay and the carrier’s $2 Better Together Savings discount. Combining these deals together works with multiple Freedom Plans.